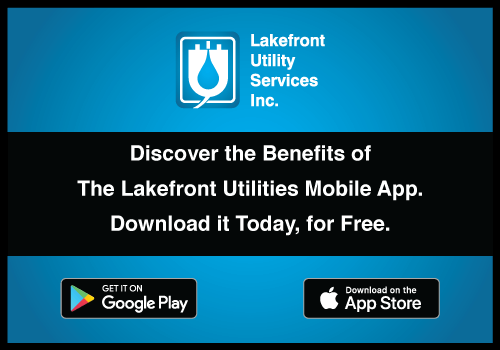 Lakefront Utility Services is excited to announce the launch of their iPhone and Android mobile app that will give its customers an automated and simple way to manage their electricity and water accounts. With this new software, Lakefront customers can retrieve billing, view consumption history, receive outage notifications and learn about conservation programs all from the comfort of their own mobile device. This app is one of the first mobile Utility solutions in Ontario to bring this information to the fingertips of the customer. Lakefront is a recognized leader in innovation and the new app is another example of how the Utility is committed to helping their community grow and adapt to the ever-changing technological world. The App complements current customer service offerings by empowering and educating water and electric customers through mobile innovation and technology. The app it is part of a pilot project with Screaming Power and Cornerstone Hydro Electric Concepts, and the parties involved are eager for customers to download the app and provide feedback for further development and direction. This mobile application has been made possible through the assistance of Screaming Power, Cornerstone Hydro Electric Concepts, the Federal Economic Development Agency for Southern Ontario and Northumberland’s Collaborative Economic Development Projects and the Ontario Centres of Excellence.